We’re proud to share one of our bigger models, the ST4060/40, manufactured specifically for the North Carolina Catepillar facility where over 2,000 Americans hold careers. According to Caterpillar News the famous construction company “invested approximately $30 million in the new facility. The 57,000 square-foot energy and light efficient office building has four system labs, meeting rooms and office space. Outside, the CMDC has dedicated 150 acres for machine development and features a half-mile, high-speed machine track, 10 test and demonstration areas and seven machine operation areas to prove machine reliability and durability. 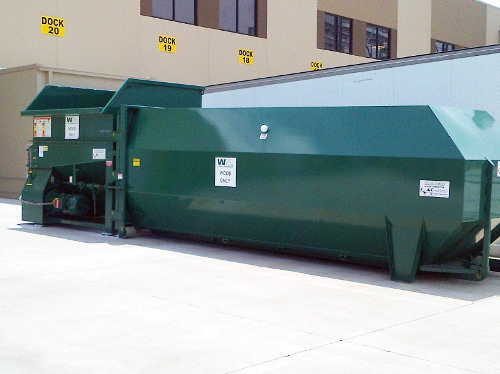 Paired with a Sani-Tech Roll Off Compaction Bin, this Industrial Compactor crushes at a displacement rate of 600 Cubic Yards / Hour and holds up to 40 cubic yards. Caterpillar first contacted us in 2010 and we have since added three Sani-Tech Compactors to fit their needs across the United States. Our machines can be used as Corrugated Compactors, Trash Compactors, Cardboard Augers, and so much more! The Auger Compactor and attached Bin pictured was installed in 2013. Sani-Tech Auger Compactors are designed to last, we have many still running 20 years after production! Using Sani-Tech Distribution Center Compactors has greatly increased this facility’s productivity. Processing waste up to five times faster and with higher compaction ratios than any other type of waste compactor on the market today.